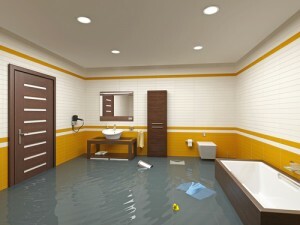 The thought of a flood coming through your home, washing over all your valued possessions and leaving a sopping, wet trail of destruction behind it is enough to make any homeowner run to their insurance company asking for the highest amount of coverage. Many homeowners’ insurance policies do not include flood damage, making it necessary to acquire a policy through the National Flood Insurance Program or other insurance companies that offer flood protection. Fiction: You need to live in a flood plain in order to qualify for flood insurance. Fact: If you live in an area prone to flooding then most likely your mortgage company will make it mandatory to purchase flood insurance, but you even if you live in a flood-free zone you still have the option of purchasing the protection. If you live outside of a flood plain then flood insurance is going to be cheaper than if you live inside its boundaries. You can also opt to buy flood insurance that only covers your possession loss. Just remember that whichever type you decide to purchase, be aware that there is a 30 day waiting period before it becomes activated. Fiction: Only areas that are considered high risk require flood insurance. Fact: Even if you do not live within the flood plain it makes sense to purchase flood insurance. With changing weather patterns, it is really hard to gauge if an otherwise dry area will experience a high volume of rain from one year to the next. Like mentioned above, it is not too expensive and it is better to be safe than sorry, especially when it comes to water damage. Fiction: Flood plains are unwavering. Fact: Just as the weather is changing, so are the flood plains. If you lived in one when you moved into your home, you might not live in one any longer. You can check whether or not you live in a flood zone by typing your address into various websites that locate flood plains or by simply asking your insurance provider. Fiction: If you have flood insurance, then it will cover all types of damage. Fact: It is important to know where your flood insurance caps off. Most federal policies will only pay out $250,000 for the structural repair of a home and $100,000 for the loss of personal possessions. This means anything that goes over that estimate is going to come out of your pocket. So, if you have a home that costs over a million dollars and it is in a high flood risk area, then you should consider buying supplemental flood insurance from a private provider. It may also be a good idea to consider a private carrier since federal insurance will only pay the current value one possessions, meaning that if your 3-year-old laptop gets drenched, you will only get back what it is currently appraised to be worth, which most likely won’t be anywhere near where you paid for it. Federal insurance also does not cover anything in the basement. Fiction: All water damage is the same. Fact: The way the flood happens basically determines the type of water damage your insurance will cover. Rain coming in through a hole in the roof will be covered, where a runoff of water flowing into your home from the nearby embankment would not be. In order to be covered on all ends, you need to purchase something called a water backup endorsement. This causes damage from both storm and flood to be covered.